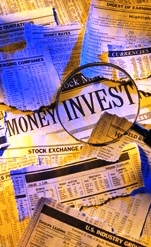 In simple economics, there is little distinction between savings and investments. One saves by reducing present consumption, while he invests in the hope of increasing future consumption.Therefore, a fisherman who spares a fish for the next catch reduces his present consumption in the hope of increasing it in the future. Most of the people probably have savings accounts with ATMs to access their hard-earned cash and be able to store away any extra cash in a place a little safer than a mattress. A few of you may even have some stocks or bonds. Let me explain why while a savings account in the bank may seem like a safer place than the mattress to store your money, in the long-term it is a losing proposition! If you open a savings account at the bank, they will pay you interest on your savings. So you think that your savings are guaranteed to grow and that makes you feel extremely good! But wait until you see what inflation will do to your investment in the long-term! The bank may pay you 5 percent interest a year on your money, if inflation is at 4 percent though; your investment is only growing at a mere 1 percent annually. Saving and investing are often used interchangeably, but they are quite different! Saving is storing money safely, such as in a bank or money market account, for short-term needs such as upcoming expenses or emergencies. Typically, you earn a low, fixed rate of return and can withdraw your money easily. Investing is taking a risk with a portion of your savings such as by buying stocks or bonds, in hopes of realizing higher long-term returns. Unlike bank savings, stocks and bonds over the long term have returned enough to outpace inflation, but they also decline in value from time to time.The rate of returns and risk for savings are often lower than for other forms of investment. Return is the income from an investment. Risk is the uncertainty that you will receive an expected return and preservation of capital. Savings are also usually more liquid. That is, you may quickly and easily convert your investment to cash. The decision about which investment to choose is influenced by factors such as yield, risk, and liquidity. Investments may produce current income while you own the investment through the payment of interest, dividends or rent payments. When you sell an investment for more than its purchase price, the profit is known as a capital gain, also called growth or capital appreciation. I’ve been busy and not been to any blogs lately. Glad to see that yours is still coming along just fine! I definitely agree with you on this. Saving is no investing. With inflation, we will only be left with peanuts. It’s nice to be able to pop by and still see good stuff being churned out at your blog. How are you doing mate? Its been a while since I saw you around. Glad you liked the post buddy, been missing your encouraging comments 🙂 . See ya around. Take care and Cheers.